Image by clintonjeff via FlickrI was at Blackberry World last week, one of the great things that came out of it is everyone was given a Blackberry playbook. I got to sit in on a discussion of the design paradigms that were used for the playbook. What follows are my notes from that presentation which gives us insight into how the design team at RIM views the design of Playbook applications. The playbook design guidelines are a very useful source to consult for anyone interested in the subject. In today's world content is king, this is even more true for tablets. The additional real estate allows for more data consumption while on the go. If I'm going to carry an extra device around, it has to bring an extra to that one specific use case, information consumption. Users are using a playbook to access content in a more natural way than a smaller form factor. When designing applications for the playbook the rule of thumb is plan for letting the user view and interact with the content. The playbook is hi-def, and widescreen. It allows for some very spiffy visualization experience. In this respect think of the content as a canvas that goes beyond the screen. 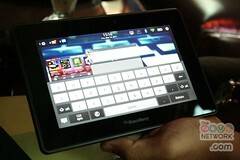 The key message is it's no longer about cascading menu that we have grown used to from the blackberry handset. In other words the screen is a window into an infinite canvas content and navigation is all sweeping gestures. This is easier said than done. The biggest challenge around this aside from understanding the functionality the user desires, is that interruptions are bound to happen in the workflow. You have to make sure that in your design interruption is baked in. Task must be über simple and efficient. The design must allow for the user to quickly fall back on her feet, understanding quickly how to resume a task after an interruption. How does your design convey the context of the task at hand? How does your design reduce the necessity of user data input?